Bulgogi Korean BBQ Beef is one of the most well-known Korean dishes. 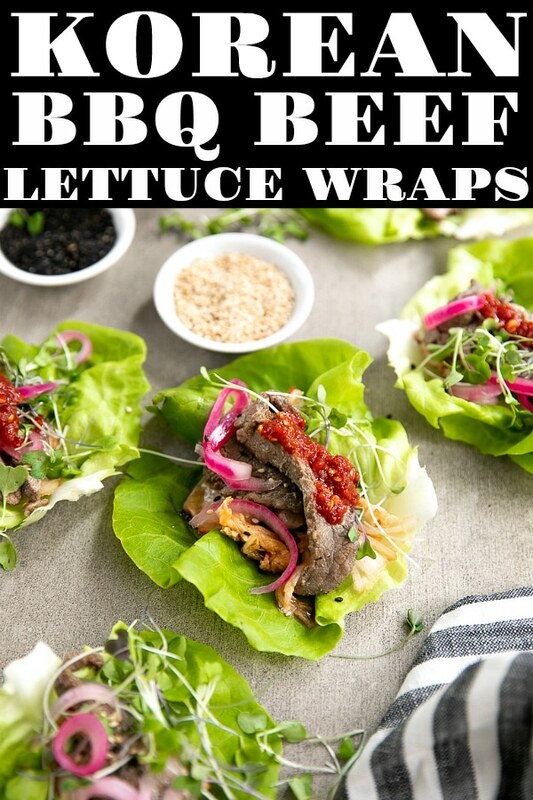 Made of thinly sliced beef sirloin marinated in a mix of soy sauce, sesame seeds, garlic, sugar, pureed pear, and other spices, this extra flavorful beef is easy to prepare and goes perfectly with rice, wrapped in lettuce wraps, or in a delicious bowl of Korean Bibimbap. WHAT IS (BULGOGI) KOREAN BBQ BEEF? 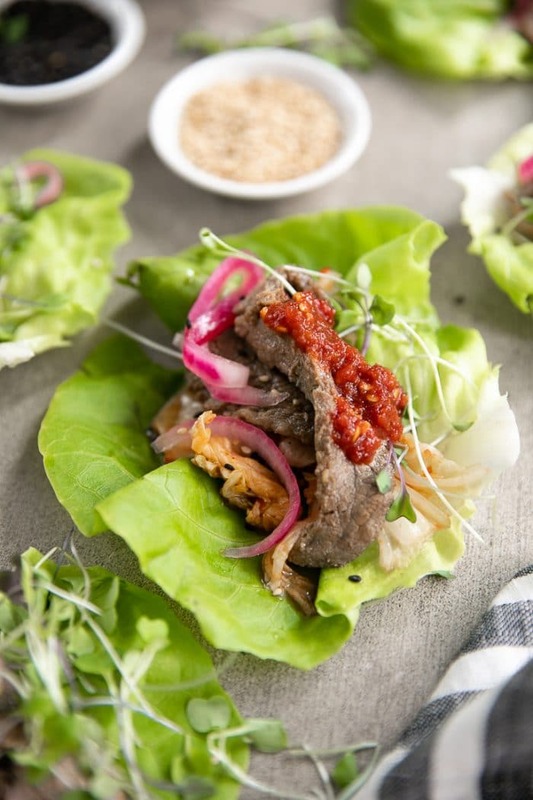 Bulgogi, which literally translates to “fire meat”, is thinly sliced beef that has been marinated and then grilled on a bbq or stove-top griddle. Unlike many Asian dishes, Bulgogi is not spicy. Instead, you will find this Korean BBQ beef to be sweet and somewhat savory thanks to the sesame oil and ginger used in the marinade. Due to its more neutral flavor, Bulgogi is loved by people of all ages. Just ask my 4-year-old. It’s his new favorite beef recipe. What cut of meat is used to make Bulgogi? When making Bulgogi, it’s important to pick the right kind of meat. The top choices are sirloin, rib eye, and brisket. However, there are several key ingredients that are (most-likely) found in all Bulgogi marinades. 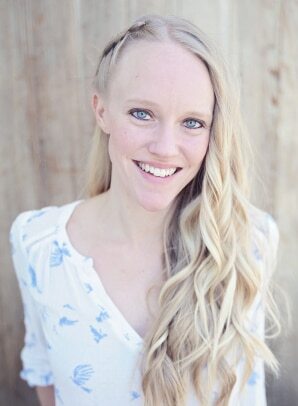 Sugar- white sugar, brown sugar, honey. Everyone has a favorite. Prepare the Bulgogi marinade. 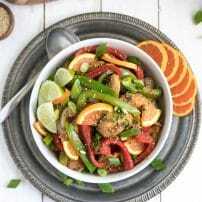 Whisk together all ingredients for the marinade in a large bowl and set aside. Marinate the meat. Transfer the thinly sliced sirloin to a large plastic ziplock bag and cover with the prepared marinade. 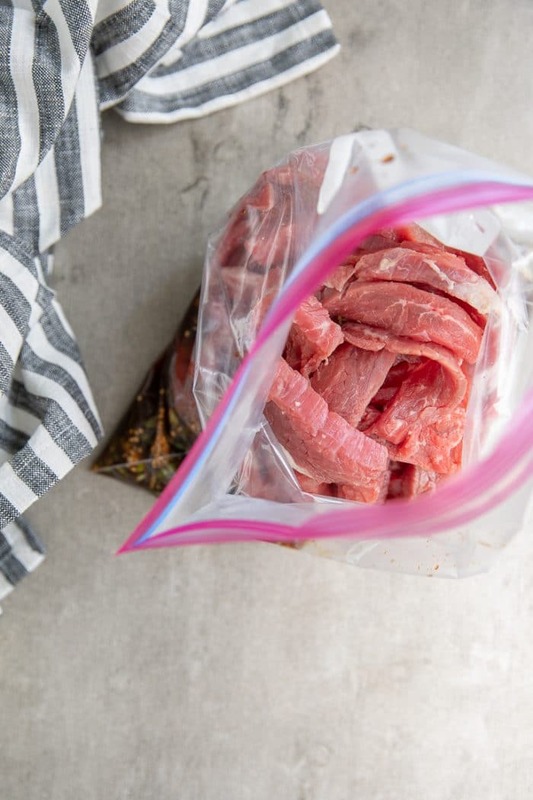 Remove all air from the ziplock bag and mix well to incorporate the marinade in with the beef. Marinate for at least 30 minutes to overnight. Cook the meat. When ready to cook, heat a large cast iron skillet or cast iron grill (or frying pan of choice) over medium-high heat. Brush with sesame oil (or olive oil) and grill beef in a single layer until fully cooked (approximately 4-5 minutes). Repeat this process until all meat has been cooked. DO NOT cook the marinated meat in the bulgogi marinade (see tip below). Serve. 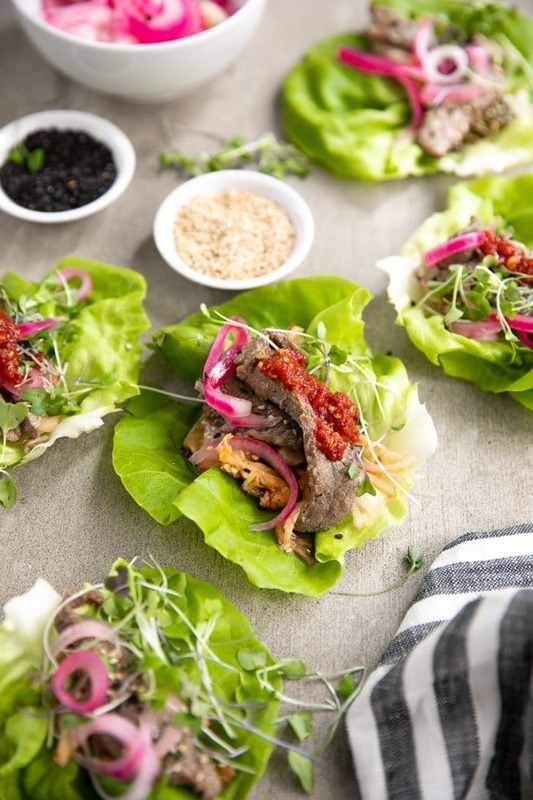 Serve with butter lettuce, Korean Kimchi, pickled red onions, and fresh micro greens. Top with sliced green onions and sesame seeds, if desired. Marinate your meat. Seriously, you guys. I know it’s hard to remember this step, but if you can, just do it. The result will be so much more flavorful! Don’t skimp on quality (rib eye, sirloin, chuck). Remember the pear. Pear is used to tenderize the meat. 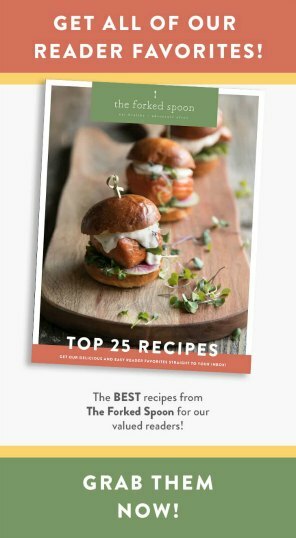 If you can find an Asian pear (Nashi pear) even better, otherwise, substitute with a regular pear, Fuji apple, or even a Kiwi. Make sure your skillet is HOT before you add the meat. DO NOT COOK THE MEAT IN THE LIQUID. 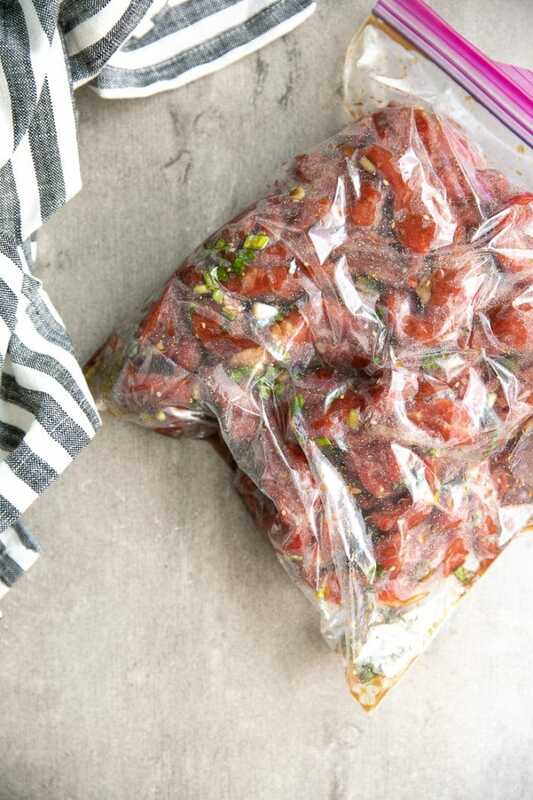 Use tongs to remove the marinated bbq beef from the ziplock bag and leave the marinade behind. Otherwise, you are steaming/boiling the meat in the delicious marinade liquid. Will it still taste delicious? Absolutely. Will it taste how it should? No. Given the name of this dish, you may think it a good idea to grill or bbq this on an actual our door grill. I’m not going to say that’s a bad idea as I have never tried that method personally, however, I urge you to reconsider. In order to be “traditional” Bulgogi Korean BBQ Beef, your meat needs to be sliced…thin. Imagine that for a quick sec on an outdoor bbq or grill. I mean, I’m no grill master or Bulgogi master, but I’m thinking the smarter way to prepare this meat is in a skillet. Do I recommend a non-stick pan? Not really. It’s just not how this delicious meat was prepared 1000 years ago. But, if that’s what you have, roll with it. Just PLEASE, never EVER NEVER use metal on non-stick pans. If you try cooking this Bulgogi Korean BBQ Beef Recipe, please leave me a comment and let me know! I always love to hear your thoughts. 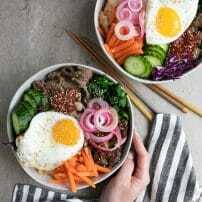 DON’T FORGET TO PIN AND SHARE THIS BULGOGI KOREAN BBQ BEEF RECIPE TO MAKE FOR A FLAVORFUL AND HEALTHY DINNER THE WHOLE FAMILY WILL LOVE. Bulgogi is a traditional Korean BBQ Beef marinated in soy sauce, sugar, sesame seeds, and pureed pear to tenderize and soften the meat. 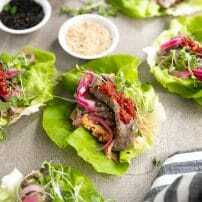 This authentic Bulgogi Korean BBQ Beef Recipe is given its own unique twist by serving it with butter lettuce, Kimchi, pickled red onions, and goechujung. Whisk together all ingredients for the marinade in a large bowl. Set aside. Transfer the thinly sliced sirloin to a large plastic ziplock bag and cover with the prepared marinade. Remove all air from the ziplock bag and mix well to incorporate the marinade in with the beef. Marinate for at least 30 minutes to overnight. When ready to cook, heat a large cast iron skillet or cast iron grill (or frying pan of choice) over medium-high heat. Brush with sesame oil (or olive oil) and grill beef in a single layer until fully cooked (approximately 4-5 minutes). Repeat this process until all meat has been cooked. 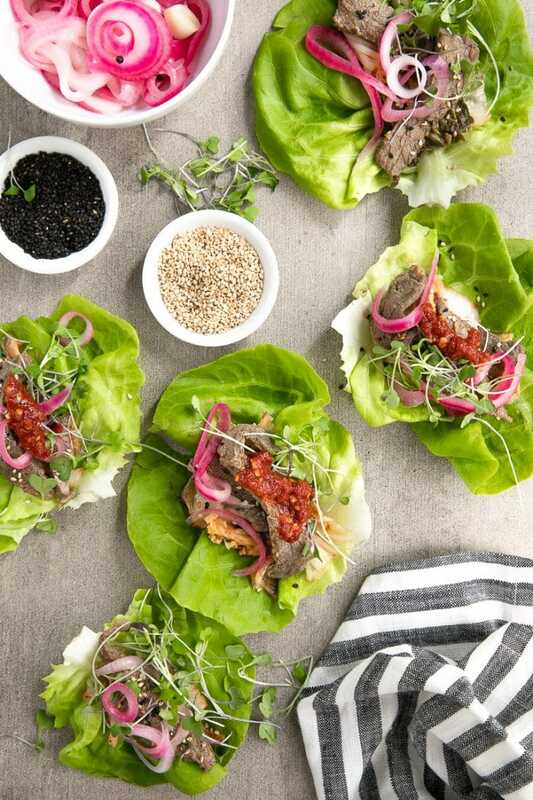 Serve with butter lettuce, Korean Kimchi, pickled red onions, and fresh micro greens. Top with sliced green onions and sesame seeds, if desired. If you can't find thinly sliced beef sirloin at your local market, simply place your beef in the freezer for one hour and allow it to freeze slightly. 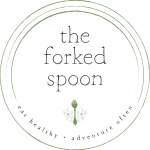 Remove from the freezer and, using a sharp knife, carefully slice the meat against the grain into slices approximately 1/8 - 1/4 inch thick. 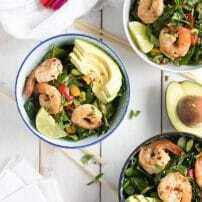 I love Korean spice – this looks so healthy!